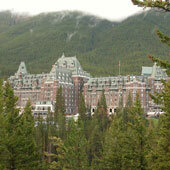 There are only two Banff luxury accommodations on my list. Now, that doesn't mean that the other lodgings on my superior list won't give you a great stay. But if you are looking for something a little out of the ordinary, I think these may be what you are looking for. These two hotels have shops, spas and amenities to make extraordinary wishes come true. The Fairmont Banff Springs is a hotel of historic importance here in Banff National Park and delivers the full package, complete with the best spa, golf and dining possibilities. The Springs offers 778 guestrooms in various designs to suit any guest. Room amenities include alarm clock-radio, cable TV, in-room pay movies and video games, coffee/tea maker, hair dryer, iron and ironing board, high speed internet access. Valet parking available. 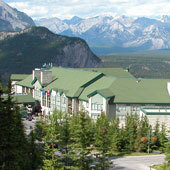 The Rimrock Resort Hotel is situated on a mountain side with great views of the surrounding area. There are four types of guestrooms to make you feel at home. Room amenities include Aveda beauty products, cable TV, in-room movies and internet games, wireless high speed internet access, radio, tea/coffee makers, hair dryer, iron and ironing board. Hotel amenities include the Primrose Dining Room as well as the Eden Dining Room in addition to the Larkspur Lounge and Divas martini jazz lounge. Enjoy live entertainment in a beautiful atmosphere.